With the BRSCC now running some 35 separate Championships and a partial involvement in a range of others, it has been taking on additional staff recently to help cope with a large and diverse portfolio. One result of these developments is that existing Championships with relatively low grid numbers are coming under pressure to share track time, hence at Brands on 23/24 March we find ourselves sharing our qualifying session with the Porsche Championship who had grid sizes similar to ours in 2018 – somewhere in the mid teens. It is notable that the Porsche Championship is also racing at the 6 of our 8 race meetings in 2019 – not a coincidence. The BRSCC has made contingency plans for us to share track time if necessary throughout the season, depending on entry levels. My counterpart at the Porsche Championship, John Broadley, is no more enthusiastic about this than I am but there isn’t much we can do about it other than getting increased numbers on our respective grids. So, to all drivers with Alfa Romeo race cars who haven’t yet registered for 2019 please dust them down and get out on track with us; let’s secure our future with the big grids our wonderful marque deserves! At Brands we will be having a joint drivers’ briefing with the Porsche drivers before qualifying. This will take place at 12.00 noon and the purpose, along with the usual subjects covered by the Clerk of the Course, will be to explain how the joint qualifying session is going to be managed. As always the Driver Briefing is mandatory so it is essential that every one of our drivers is there. Also at Brands I will be coming around to speak with all our drivers to get from them information that I have to compile for the BRSCC concerning our general Paddock space requirements to assist them in planning the amount of paddock space we need and are entitled to at race meetings this season. This will cover towing vehicles, working space, awnings, support vehicles and any other relevant information that affects paddock space. Steve Green will be managing paddock space for the weekend and we do have a good allocation of space at this meeting, so the usual applies – please give Steve your full cooperation. He will be assisted by Tony Hastings who I understand will be involved in this role for the first time. Finally, Motorsport UK has introduced new limitations on access to the Pit Wall during qualify and races. Each driver will need to take a completed form with them to signing on which states the names of those who will be on the pit wall on their behalf – up to a maximum of 2 people per driver are allowed. Apparently there were a number of pit lane incidents last year (not involving us) which has led Motorsport UK to introduce this for all UK circuit racing events. Marshals will be present to prevent anyone who hasn’t had prior clearance from getting to the pit wall. I will email the form out to drivers this week and also bring paper copies with me to help with this. It should be simple enough and hopefully drivers can cooperate with each other over their nominations if necessary. if a driver is preparing a car with the aim of entering when it is ready, they would be better off putting in the entry before the two week deadline. They can then withdraw with a full refund (less £10 if paid with a credit/debit card) up to midnight on the Sunday beforehand, so just 5 days before the meeting. Also, if they are waiting on delivery of a part etc they should let me know and I will raise it with the BRSCC who may then look at their situation more sympathetically. I think this is very helpful information and should enable drivers to avoid the surcharge other than in situations where they’ve just left it too late to enter for no substantive reason. Incidentally it isn’t just the BRSCC that makes a surcharge for late entries – the BARC imposes a similar penalty for example – and its purpose is to make the planning of race meetings more efficient and effective. “BRSCC Entry Fee Payment & Refund policy Entry Fees: As specified in Section 2.1 of the Championship/Series Regulations, an entry not accompanied by the correct Entry Fee is not a valid entry. Drivers are reminded that once they have notified the Club of their intention to enter a meeting, by way of a booking, they have agreed to take part in the meeting and agree to comply with the Entry Fee payment terms, which shall be 14 days prior to the start date of every meeting/round. Late Entry/Payment Fee surcharges shall be payable for any entries received after midnight on the Sunday, two working weeks prior to the start date of the meeting. The Late Entry/Payment Fee is £25.00 as specified in the Supplementary Regulations and on the Entry Form. Refunds will only be payable per the Refund Policy stated below. No refunds will be given for cancellations received after the above deadline, even if the competitor withdraws due to any mechanical failure/accident damage during testing in the days leading up to the meeting. Drivers are allocated a number of free tickets to a race meeting, but sometimes they may not need all of them and sometimes they may need more than the normal allocation, e.g. if they are bringing extra guests or sponsors to a particular meeting. Paul Webster has come up with the very helpful idea of pooling this information in order to help transfer tickets from those who don’t need one or more of their tickets to those who are looking for extra ones. Even more helpfully Paul has volunteered to coordinate this. The basic idea is that anyone with spare tickets should contact Paul and forward them on to him (if they are e-tickets), and likewise if someone needs extra tickets they should contact Paul to ask if he has any that he could make available to them. Paul is putting together some information on this which we will put out to all registered drivers shortly. A great idea and our thanks go to Paul for coming up with it. You may have noticed that the alfaracer website has undergone a facelift – it looks more impressive and is even easier to navigate than before. The web hosting has been revised in order to make the functioning of the site more reliable and efficient, and also quicker to fix if anything malfunctions, so it works better as well. As always, we owe a big vote of thanks to Matt Daly for getting all this sorted out. I really don’t know what we’d do without him! 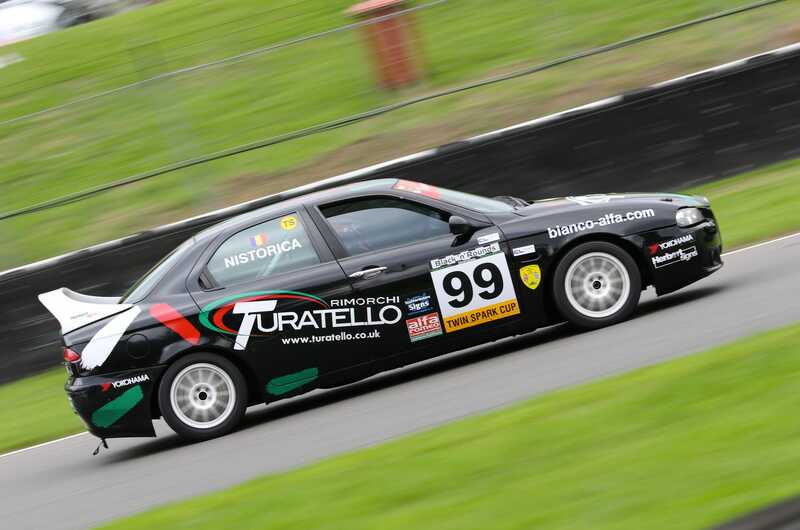 We have entered into an agreement with AJKTV to film our races at Cadwell Park and Silverstone this year. This will give us important media coverage which is considerably enhanced if drivers release their in-car camera coverage to AJK as well. It enables them to put together an exciting visual and audio race video package to the benefit of the Championship as a whole. To provide the requisite quality it is important for the driver to send the coverage direct to them; if it’s just posted online (which is great as well) it does not have the requisite quality if AJK can only access it by downloading it from the web. So please can I ask for drivers’ support in releasing their material to AJK for those meetings. Many thanks in anticipation….